The HD community across Canada is a group of passionate and generous people who aspire to a world free from Huntington disease. This group of people support one another and know that there are few people in the world that fully understand what everyday life is like for a person or family affected by this disease. This makes the HD community unique, this makes them a family. Thanks to this amazing community, the Huntington Society of Canada receives a large portion of their funds from Chapter and volunteer fundraising efforts to put towards research and family services for affected individuals and families. These fundraising events are integral in allowing HSC to support the HD community. We invite you to participate in this dedicated community any way you can and recruit friends and family to join as well. Let us know what you’re good at! Are you a musician, photographer, writer? TeamHD can use all of your talents to benefit those affected by HD. Our teamHD Facebook page is full of opportunities to get involved and be a part of the team! You can keep up with the community and share your photos and experiences by posting on Facebook or using our hashtag #teamHDcan on Twitter and Instagram. Help spread the word and raise money by joining teamHD! 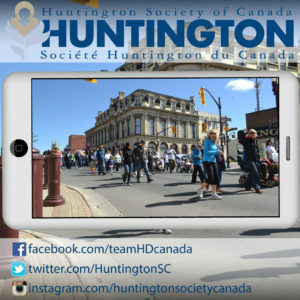 For more information about events or how to get involved, email us at events@huntingtonsociety.ca.